IMPORTANT NOTE: This walking tour of the Old Town gives you the Prague landmarks and the atmosphere that make Prague Europe’s #1 short-break destination. We meet at Mozart’s favorite spot in Prague: the Estates Theater, where he premiered the unforgettable Don Giovanni’. We then walk to the meeting point of every European jet-setter: Old Town Square, locally known to us as ‘Staromak’. We step on the square in time to be prepared and see the world’s oldest working clock in action at 2pm: the chiming of the Astronomical Clock, the pride of Prague. 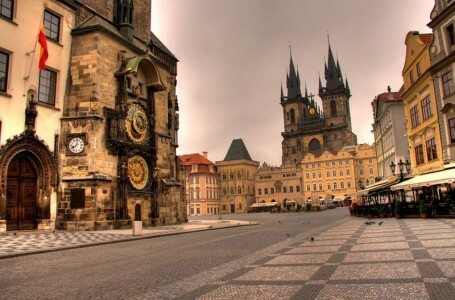 The Old town walking tour then embarks on an intricate journey through the maze of old-town Prague that includes the Tyn Church, Prague university, the extravagant Paris street, and many picture-perfect back alleys. A new aspect of Prague then comes to life when we enter the Jewish ghost town – once the home to a vibrant Jewish community before Nazi occupation and assassinations. The finale is at the Rudolfinum theater, with possibly the single best view over the river and the Prague castle. Old Town tour starts on time at 1.45pm rain or shine on Tuesdays and Fridays and lasts a leisurely 90 minutes. We meet outside the Estates theater near the Old town square. Closest metro station: Mustek (line A & B). This tour ends near Rudolfinum. Look for our distinctive pink vests and pink umbrellas. This is the walking tour to take when you first arrive in Prague – to get situated, to hit the must-sees, to absorb Prague’s unique atmosphere, and to learn routes away from crowds and into the real Prague. The price is €15/person, and €9 for people 18 and under. Groups of friends, families, and school groups looking for an opportunity to share private time together often reserve a private guide. A private tour starts at only €65 (up to 20 guests advised). (€65 base price, then add €8/person for guest 3 and up). We meet outside the Estates theater near the Old town square. At 1.45pm by reservation only. Closest metro station: Mustek (line A & B).